LOS ANGELES, April 9, 2019 /PRNewswire/ -- Age of Learning, Inc.®, the creator of the highly successful ABCmouse® online learning program used by millions of children ages 2 to 8, today announced the upcoming release of Adventure Academy, a massively multiplayer online game for elementary and middle school age children featuring thousands of learning activities in a fun and safe virtual world. 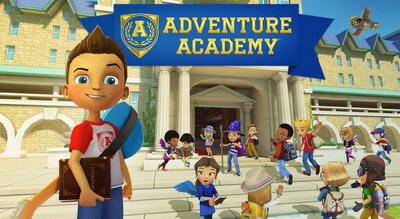 Available for families on computers, tablets, and smartphones beginning May 1st, Adventure Academy "brings learning to life"TM as it builds critical knowledge of essential curriculum topics in language arts, math, science, social studies, and more. With a substantial investment over the past three years, commensurate with those made in other premier (or "AAA") online games, Age of Learning assembled a world-class team of curriculum and instructional design experts, master teachers, game designers, artists, animators, and engineers to build Adventure Academy with the quality and engaging features of a AAA game. The curriculum team comprises experts with hundreds of years of combined classroom and curriculum development experience. The game development process is led by creators of some of the most successful titles in the history of online gaming, including Kevin Beardslee, one of the original creators of World of Warcraft®; and Alex Galvagni, former General Manager of leading game studio Turbine®, creators of The Lord of the Rings Online®, Batman: Arkham UnderworldTM, Dungeons and Dragons Online®, and Game of Thrones Conquest®. "Our sole focus at Age of Learning is to help children build a strong foundation for academic success," said Doug Dohring, founder and CEO of Age of Learning. "Our outstanding team has executed on this mission for many years, developing highly engaging and effective educational programs that early learners enjoy, and families and teachers trust. Adventure Academy allows us to now meet parents' demands to bring learning to life for older students during the critical elementary and middle school years." In developing Adventure Academy, Age of Learning's curriculum leadership conducted an in-depth review of state, national, and international educational standards, and collaborated with practicing teachers across the United States to identify the highest priority curriculum topics that students have the most difficulty with in school. As a result, the Adventure Academy curriculum emphasizes key topics such as reading comprehension, vocabulary development, mathematical operations, fractions, world geography, American history, physical science, life science, earth science, and scientific inquiry. "Too many of our students struggle in elementary school and beyond because of gaps in their understanding of key academic knowledge and skills," said Kimberly Oliver Burnim, a National Teacher of the Year and Age of Learning Curriculum Board Member. "There's never been an educational program like Adventure Academy, which can engage elementary and middle school students so fully and help them grasp challenging concepts so effectively. It's a revolutionary resource for families." "It's amazing to hear my son talk about what he learned in the game and connect it to everyday experiences," said Sally Bjorklund, whose son was one of the early adopters of Adventure Academy. "We recently visited a science museum and one of his favorite exhibits was a pulley system that looked identical to the one in Adventure Academy. He was so excited to show us how it worked! Having this tool has been invaluable for our family." Age of Learning is a leading education technology innovator, creating engaging and effective learning resources to help children build a strong foundation for academic success. Based in Los Angeles, the company is Bringing Learning to Life® by blending educational expertise, innovative technology, and insightful creativity. Age of Learning's flagship product in the U.S., ABCmouse.com® Early Learning Academy, is a comprehensive curriculum for preschool through 2nd grade, available on all major digital platforms and used by millions of children. Age of Learning recently launched ReadingIQTM, an advanced digital library for children 12 and under designed by literacy experts, with thousands of high-quality books from leading publishers, including the largest collection of National Geographic Kids digital titles available anywhere. Connect with Age of Learning on LinkedIn, Twitter, YouTube, and Facebook.